COLLEGE this knock-knock joke may hit home! 3) APPLY to college of choice & meet their SCHOLARSHIP deadlines! jobs on campus with pay. Baseball tonight in Garrison at 6:00 p.m.
THS Yearbook - The last Timpson High School yearbook sale for the year begins Monday, 2/27. The cost is $50.00 each. There are only 40 copies left to reserve. Notice is hereby given that a Special Meeting of the Board ofTrustees of the Tenaha Independent School District will be held on Thursday, March 2, 2017 beginning at 5:30p.m. in the Boardroom of the Administration office located at 138 College Street, Tenaha, Texas 75974. Texas FFA Day at Texas State Capitol – Austin, Texas – For two days the Texas State Capitol will become a classroom as more than 800 Texas FFA members and agricultural educators visit Austin on Feb. 21st and 23rd. Students will learn about the state’s legislation process, especially as it relates to agriculture, at the eighth annual Agricultural Education and Texas FFA Day at the Capitol, co-hosted by the Vocational Agriculture Teachers Association of Texas and the Texas FFA Association. Since 2010, Texas FFA members have gathered in Austin to celebrate the organization and advocate for the continued support of agricultural education. Throughout the day members will meet with their state legislators, walk the Capitol hallways, and see where history has been made since 1889. The event provides a unique opportunity for high school students to learn from various players in the state’s legislative process. Members and guests enjoyed keynote speeches from Representative DeWayne Burns and Representative Trent Ashby. “Texas FFA Day at the Capitol provides the opportunity for our state leaders to see the true impact agricultural education and the FFA has on our state,” said 2016-2017 Texas FFA President, Jake Traylor. The experience also allows our members the opportunity to witness the legislative process, and how they can affect change in their own communities.” Timpson High School FFA students attended this event with their teacher Mrs. Kristin Powers. The students (Amanda Yates, Chase Clepper, Kayleigh Scroggins, Connor Timmons and Macy Jo Hanson) were invited to Texas Agriculture Commissioner Sid Miller’s office to meet one-on-one with Commissioner Miller. While in his office, the students had the opportunity to attend a press conference. Commissioner Miller’s office is located at the Stephen F. Austin Building. Students also met with governmental liaison Allisa Nolan and other Texas Department of Agriculture staff members. THS Floral Design Classes - The Timpson High School floral design classes finished a unit titled Miniature Landscapes. Students made fairy garden furniture and designed a container grown landscape. Students were encouraged to be creative and include unique features that match their personality and interests. Photo attached. TISD Basketball Benefit – Just a reminder that the Timpson ISD employees and students will play a benefit basketball game tonight, Friday Feb. 24th in the high school gym. Doors will open at 5:30 p.m. and tip-off is at 6:00 p.m. The purpose of the benefit is to raise money to help offset the ongoing medical expenses of two of our TISD family members – fourth grade student Claycee Renick and elementary/middle school counselor Tammy Sparks. Cost of admission is two dollars for children and three dollars for adults. Everyone is invited to come out tonight to join the fun and help with a great cause. Wednesday night and came out on top, 75-70. 34-29 at half time and carried that momentum into the second half as well. But it wouldn't be easy. ball and had 6 crucial offensive rebounds to head into the fourth up 45-50. Rivera added 11 points for the Fillies as well. that the Fillies will be sporting will be up for an online/silent auction. Be sure to wear Pink and cheer on our Fillies. On Wednesday, February 15th, 2017, Timpson Elementary School pre-k went with Mrs. Powers 7th period class to plant strawberries, peppers, broccoli, and other plants in their raised beds. Pre-K was able to dig holes, place the plants in the holes and water the plants. 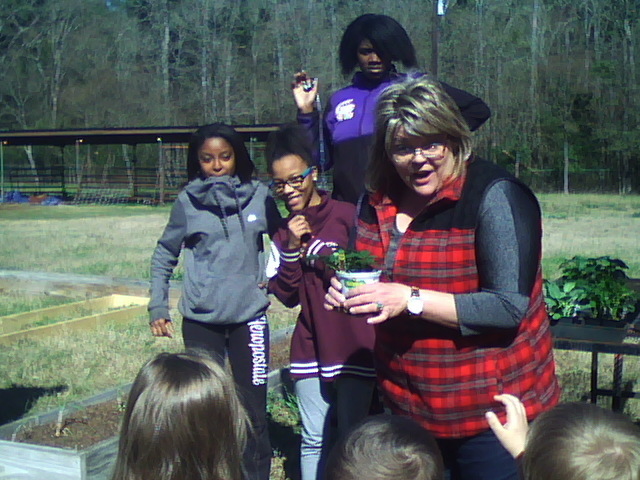 It was a great way to teach students where their food comes from. My class was so excited. Mrs. Powers, thank you so much for letting us come. Black History Month – February is Black History month. Black History month honors the contributions of African Americas to United States history. Attached are photos of Timpson Elementary School students’ projects and displays. **If the Lady Tigers win they will play Saturday at 2 pm. A fan bus will be provided. Tickets for the fan bus Saturday will be $20 for adults and $15.00 for students (includes admission to game) on a first come first serve basis on site. The bus will depart from Tiger parking lot at 10:30 am. The bus will return to Tenaha immediately following the game. Both trips will be non-stop. the Regional Meet next month. Congratulations and Good Luck at Regionals!! The Panola Pipers Choir presented a selection of love songs for the February Delta Gamma meeting at Tenaha First Baptist Church. This was a combined meeting with Panola chapter, Epsilon Iota. The choir is led by Epsilon Iota member, Sandra Bauer. The choir sang songs from the present as well as previous decades. Both chapters, as well as visitors enjoyed the evening and visited afterwards with refreshments. Delta Gamma and Epsilon Iota are local chapters of the international organization of key women educators, Delta Kappa Gamma Society International. Let's show East Texas who has the ROWDIEST fan base in Hoops!! Kindergarten learning how to subtract! Kindergarteners learning how to READ! Accelerated Reader shopping for prizes day! --------- Baseball vs. Grapeland – Home @ 6:00 p.m.
Tues. Feb. 21 – Twirler/Drum Major Tryouts – THS Band Hall @ 4:00 p.m.
Congratulations to these young men! It's time to CALL OUT THE WHOLE TIGER NATION!! Beginning in fall 2017, Panola College will offer an Associate of Applied Science (AAS) degree and a Level 1 certificate in Ranch and Land Management. Students who wish to pursue an advanced degree beyond the AAS may transfer to Stephen F. Austin State University to work toward a bachelor of applied arts and sciences degree. Dr. Joe Shannon, Vice President for Instruction, said the new degree and certificate will benefit Panola College students who are interested in enhancing their knowledge of agricultural productivity and land stewardship. “We have worked diligently for more than a year to create this new opportunity for our students,” he said. 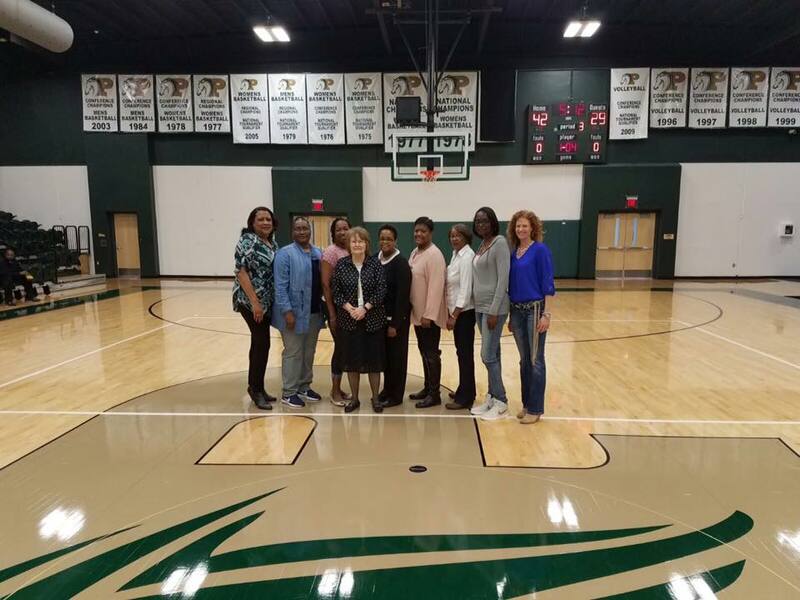 An advisory board worked with Panola College to design and implement the new degree program. Board members include Lee Dudley, Texas A&M Agri-Life; Chris Adams, Bird & Crawford Forestry; Lee Anderson, Texas Forest Service; Dr. John Ray; Ken Smith, Hancock Forestry; Tim L. Holland, Certified Forester; Stephen A. McInnis, Southern Power Company; Joe Shaw, Southeast Recruiter-Trainer, Davey Tree Company; Ron Hufford, Director, Texas Forestry Association; Kevin Schmidt, Owner, Doodley Dee’s Farms; Mike Fox, Member, Cattleman’s Association; Jack Dillard; Cody Bush; and James Houser, Vice President, Forest Resources Management. 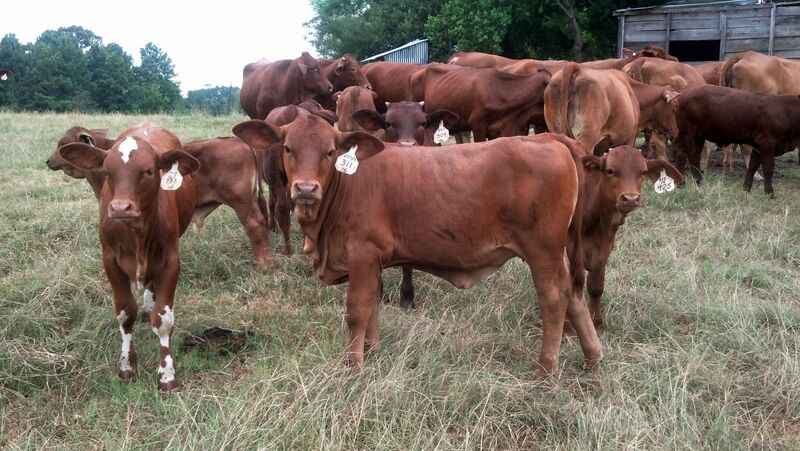 The AAS degree and certificate are designed to promote conservation, management, maintenance and productivity of farm and ranch land, with emphasis on livestock grazing, habitat, water, recreation, minerals, and agricultural uses. Courses approved for the degree include ranch and land management construction skills, introduction to mechanical engines, animal science, basic electrical theory, introduction to welding, basic hydraulics, forage and pasture management, beef cattle production, soil science, wild pig management and control, management and biology of whitetail deer, pond construction and management, and entomology. In addition, to earn the AAS degree students will complete core curriculum courses in basic academic areas. Students who complete the AAS at Panola will be able to transfer those credits to Stephen F. Austin State University to pursue a Bachelor of Applied Arts and Sciences degree in Agricultural Technology. This partnership with SFASU also applies to students in Panola College’s energy technology disciplines. Previously, technical coursework counted toward associate degrees completed at Panola College. With approval from the Texas Higher Education Coordinating Board, technical coursework toward associate of applied science degrees in these areas of specialization are now counted as course credit for the BAAS degree at SFASU. “Our students and regional employers have expressed a need for bachelor’s degree options for technical fields. We are proud to have been able to meet this need through a partnership with SFA, the university of choice for most of our students,” Dr. Shannon says. For more information, contact Natalie Oswalt at Panola College, email noswalt@panola.edu or call 936-591-9075. Natalie Oswalt, Dean of Professional and Technical Programs, along with Dr. Greg Powell, Panola College President, and Dr. Joe Shannon, Vice President of Instruction, check out a training unit in the technical laboratory on the Carthage campus. Additional training systems are available at the Shelby Regional Training Center in Center. 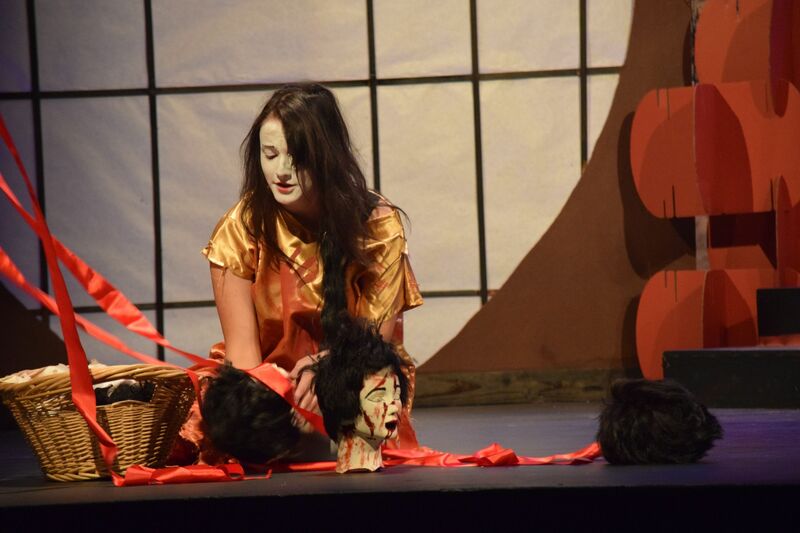 College Theater Regional Festival at Angelo State University in San Angelo. Mason, Dean of Liberal Arts & Sciences. 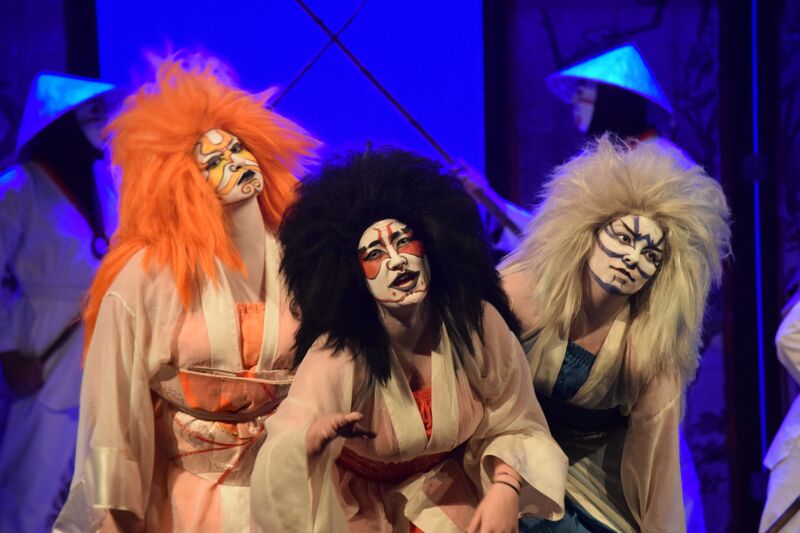 the theater students’ trip to San Angelo for the regional competition. 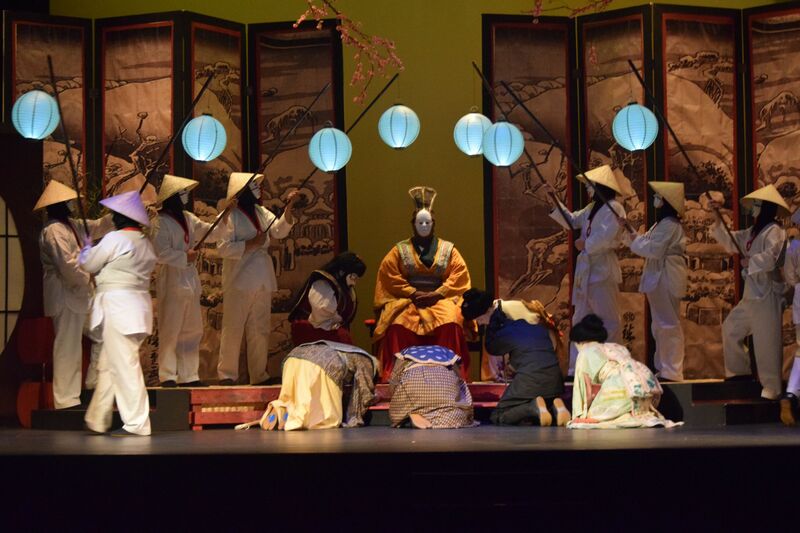 festival is quite an honor, says Karen King, professor of theater. Trahan, Julian Johnson and Joseph Allred. 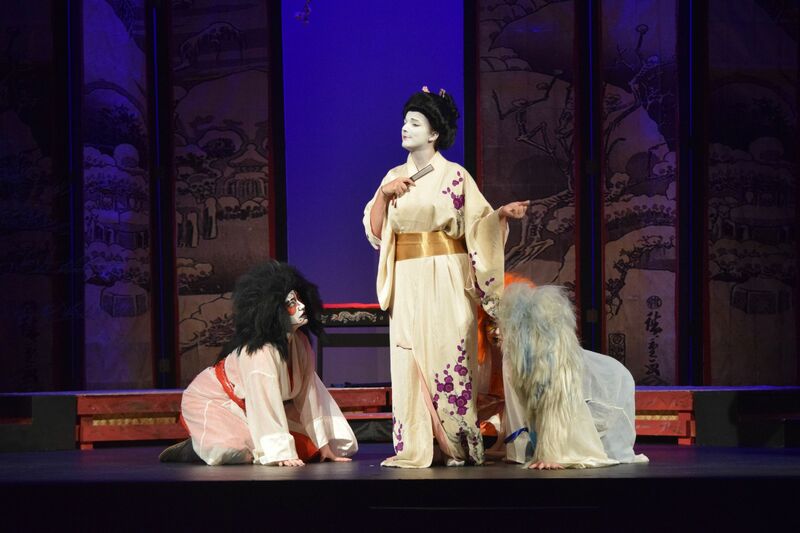 King, professor of theater, won the directing award. University, along with the showcase production by Panola College. scholarships, and honors from the organization. Enolia Snogsbiean, and Jayne Fuller. Wyatt, Brandon Castillo, Leonard Maxwell, and Wyatt Williams. Due to the bi-district playoff game, the CHS Project Graduation parent meeting has been rescheduled for Thursday, February 23rd. CHS Project Graduation parent meeting will be at 5:30 in the HS cafetorium. All parents/guardians of the class of 2017 are encouraged to attend. We will discuss upcoming fundraising events. You can contact Anna Stuever (936-657-4848 or astuever@gmail.com) for more information. NACOGDOCHES, Texas - Stephen F. Austin State University has been named one of the top 10 best value colleges in the nation for its online master's degree in early childhood education by College Values Online, a website dedicated to helping students select the best university for them. "As faculty members, we are proud of the knowledge and experiences our students gain through the innovative and diverse degree program at SFA," said Dr. Susan Casey, program coordinator for SFA's online master's degree in early childhood education. "We are excited about the recognition because it validates the degrees our students receive and enables them to further their career opportunities." The ranking criteria include awards and recognition, 20-year net return on investments, customization options, innovative programs, scholarship and internship opportunities, related student organizations and more. "In today's world of diverse experiences, there are various challenges in the work place, and knowledge is the key to unlocking the potential of all of our graduate students," Casey said. "This degree will open the door for them as they enter the work environment in hospitals, early childhood state intervention programs, childcare centers, day care licensing, lead teacher roles and many other fields. Our world will always have children to educate, and the master's degree opens endless possibilities." SFA's Master of Education in early childhood education is a 36-credit hour program and is designed to develop specialized competency in organizing programs for young children and families through in-depth study and research related to child growth and development, theoretical underpinnings of classroom practice, development of learning strategies and sociological and psychological factors influencing behavior in young children. Courses are offered completely online through SFA's learning management system, Desire2Learn, and they are taught in half-semester formats. Students may determine the pace at which they progress, but generally, it takes two years to complete the program. "Our early childhood master's degree program allows students to fully participate in active learning no matter where they live," Casey said. For more information, visit http://www.sfasu.edu/elementaryed/103.asp. Friday when they take on Broaddus in the Area Finals in Wells at 6:00 PM. Broaddus finished in 2nd place in District 23-2A. part of a five game slate of playoff preview matchups. Mrs. Wiist’s 8th Grade math classes are proud to announce the winner of our Month #4 Khan Academy “Points” Contest. 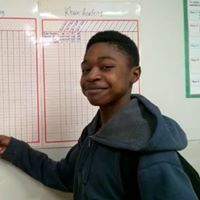 Quinnon Gardner finished the contest, which ran from Jan 9th to February 8th, with a total of 11,677 points and 108 minutes of active problem-solving time. Congratulations, Quinnon!!! Each month, students compete for the $10.00 monthly prize by completing 8th grade math questions on their Khan Academy site. Students can work on Khan Academy before or after school, after classroom lessons are completed, during Tiger Tutorials or even at home with any Internet connection. The site is also available through an app for most smart phones and tablets. The point totals are filtered for each month, so previously earned points are not included in the winning tabulation. As students progress through the 8th grade concepts, they earn points, badges, and new avatars by correctly answering questions and watching the associated math videos available for each 8th Grade math concept. Khan Academy is a free, online learning site that is donation and supporter funded. Students who have an account can practice math concepts at any grade level from Kindergarten (Early Math) through 8th by grade level and High School and College level math by course (Algebra 1, Algebra 2, Geometry, Trigonometry, Calculus, SAT, GMAT, MCAT, etc.). Students can even search for specific math concepts to practice. Khan Academy is an amazing practice tool for students to fill any conceptual gaps, practice difficult topics, or even get ahead in the curriculum. Khan Academy is completely self paced and adaptive to each student’s strengths and weaknesses. Stay tuned for next month’s winner (February 9-March 8) and please help encourage Mrs. Wiist’s students to EARN THOSE POINTS! 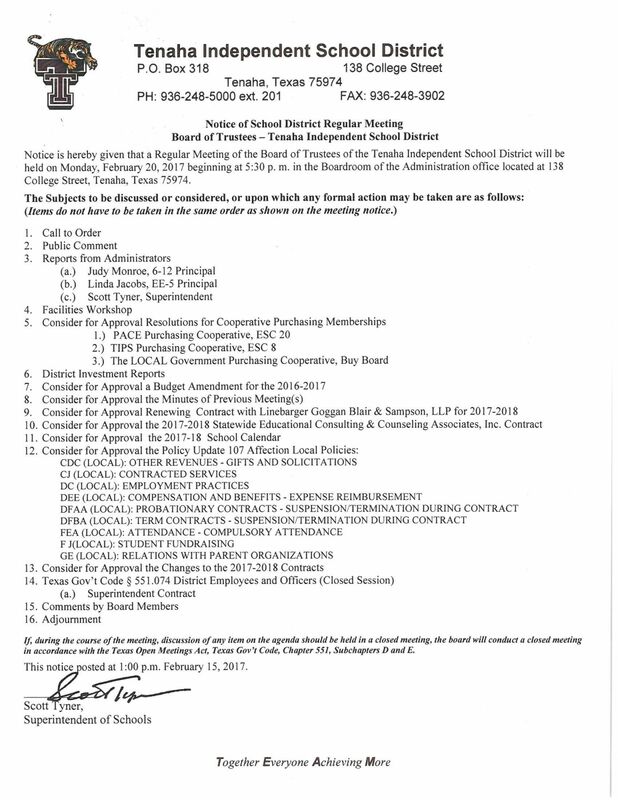 Collegiate Center News – The Timpson High School Collegiate Center staff met with Mary Francis Bradford, director of the Nacogdoches Economic Development to determine which jobs local businesses, schools and industries are needing to fill. This information helps the staff guide students in regard to the courses they need to take in order to get a job that relates to the students’ interests and abilities and to employment opportunities. Some of the jobs required 2-4 year college degrees such as teaching, registered nursing and many of them require certifications and licenses that can be completed in a shorter time such as computer skills, welding, machine/equipment operators, plumbing and electrical. The Collegiate Center staff also met with the President/CEO of the Nacogdoches Chamber of Commerce, C. Wayne Mitchell, who was a recent guest speaker at the Timpson Chamber of Commerce banquet this year. He told the staff he would be inviting them to future business lunches with local business/industry leaders to keep them updated on business and employment opportunities for students following graduation. TISD Board Member Spotlight – Mr. Stephen Burgay serves as a member of the Timpson ISD Board of Trustees. He has been a member for 6 years. He is a proud graduate of Timpson High School. Mr. Burgay and wife, Belinda, have 2 children, Chandler and McKensie. Chandler is a freshman at Stephen F. Austin State University who graduated from THS in 2016 as salutatorian. McKensie is a sophomore at THS. The Burgay family attends Good Hope Baptist Church. Part of what motivates Mr. Burgay to serve on the board is that he wants for all children in TISD the same thing he wants for his own children which is to have the opportunity to be successful in a academics and have the opportunity to be involved in extra-curricular activities. Mr. Burgay also decided to serve on the board because it gives him the ability to serve the school from which he graduated and to do whatever possible to assist the district in whatever is needed. As a manager at Tyson foods, Mr. Burgay understands the importance of maintaining and upgrading facilities. He is excited about the passage of the bond election which will allow the district to upgade facilities and build new buildings that will allow the district to stay with ever-changing student needs and to be able to have a school district that students, staff and community can be proud of and to provide the safest possible environment for TISD’s students and staff. Mr. Burgay said he really enjoys serving on the board and being able to give back to the school that gave him so much. He enjoys the close knit environment of everyone from the board to the administration to the staff and students. TISD staff and students appreciate Mr. Burgay and his service to our school district. Summerfield early next week at a site and time yet to be determined. Grapeland, and Italy as the "on paper" favorites to battle for the crown. Colmesneil, Broaddus, and tonight's opponent Mount Enterprise. alumni from different decades and brought in their 18th win on the season. being offensive. Sophomore Genesis Rivera led the Fillies with 14 points. Tuesday: Lady Tigers vs Mt. Enterprise in Gary @ 7:00 pm. ------------------- JVB/VB basketball vs. Chireno – Here @ 4:30 p.m.
Fri. Feb. 17 – Varsity baseball vs. Carlisle – There @ 4:00 p.m.
TISD Board Member Spotlight – Jim Rader has served on the Timpson ISD Board of Trustees for the past 21 months. Jim is married to Melanie Rader. They have two daughters they are very proud of, Kaylie, who is attending SFA, and Kristyn, who is a junior at THS. They attend Good Hope Baptist Church in Timpson. Jim is very appreciative to be able to serve on the board. He believes that Timpson SD has been a great school for our past students and current students. He is very proud and thankful of our community, our state and these great United States in which we live. Jim is very grateful of the hard work of our teachers, coaches, administrators and support staff at TISD and the good work that they do. Jim believes these dedicated educators have shown continued persistence and care that inspires and empowers our students. Jim is very thankful that Timpson ISD has provided that opportunity, not only for his children but for many others over the years. Mr. Rader feels that as a parent, you are always striving for more opportunities of success for your children. With the new construction additions that the TISD is getting ready to start, TISD will be able to provide more opportunities for our educators and students over the coming years. Mr. Rader is very aware that the passing of the bond can be difficult for the property tax payers., As a board member, oversight and due diligence of those funds are of great priority and to the best of Jim’s ability he will work hard to ensure that all the funds are used smartly and wisely. The students and staff appreciate Mr. Rader’s service to our school and community. Collegiate Center News – Nacogdoches ISD staff members Shirley Lolly and Josh McClaine met with Timpson ISD Director of Academic Services Stephanie Behrens, Counselor Charlotte Metcalf, Go Center Director Vernett Richardson, Superintendent Mid Johnson and Assistant Superintendent Mary Lynn Tinkle to share ideas/programing to meet the needs of students who are enrolled in dual credit/vocational/technical classes. Ms. Lolly and Mr. McClaine were especially interested in learning how Timpson staff have encouraged and recruited a diverse population of students to enroll in dual credit classes. They were also quite impressed that the district paid the tuition, fees and books for students taking the dual credit classes. In other Collegiate Center news, 100% of students taking dual credit classes in the fall passed the courses they took giving them college and high school course credit. School yearbook submitted by junior Britney Vargas. Congratulations Britney! Pineywoods District Public Speaking Results! On February 6th the Timpson FFA Chapter competed in the Pineywoods District Convention Public Speaking Contest. TISD Board Member Spotlight – JustinTimmons is serving his first year as a Timpson ISD Board Trustee. Mr. Timmons is a nurse practitioner at Texas Quick Care. He attends church at Corinth Missionary Church where he serves as the teen Sunday School teacher. Mr. Timmons said he was motivated to run for the school board because he and his wife, Katy, have four children in school: Connor, Kaleigh, Quinn and Caroline as well as many nieces and nephews. His goal for all Timpson ISD students is the same goal for his own children which is to see that all attention and focus is on helping all students succeed. Mr. Timmons’ top priority for the school is on meeting the academic needs of students but he also sees the importance and value of extra-curricular activities offered at the school. Mr. Timmons enjoys serving on the board because he sees it as an opportunity to be part of a team that is doing what is best for Timpson’s children and the community. Mr. Timmons said he is proud of each Timpson ISD student and what they accomplish. He likes the fact that most all of the students know each other or are family. He is also very proud that there is a strong Christian based group of kids and teachers. Mr. Timmons is an outstanding role model for our students and we appreciate his service to the students, staff, parents and community. The Kilgore JV tennis tournament has been pushed back to Wednesday 2/15 due to the forecast for Tuesday. 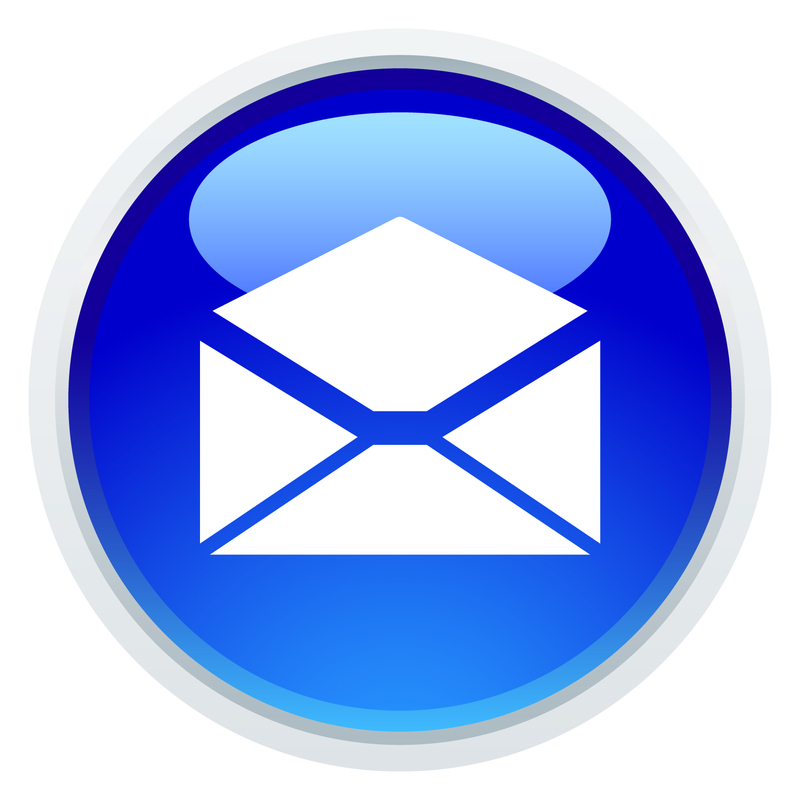 Reminder: February 17th is the last day to file application for place on the ballot. January 24, 2017 - Timpson ISD Board of Trustee Election will be held May 6, 2017. Important dates and information are listed below. Election Day - May 6, 2017 - Polls will be open from 7:00 a.m. until 7:00 p.m. Reminder today is final sign ups for baseball and softball. It will be at Word of Faith gym from 5:30-7:30. Any questions please call 903-263-7076.
tie for the District Title! Excelsior School is teaming up with the Alcohol & Drug Abuse Council to provide a 10 week program teaching students about peer pressure, bullying, and setting goals for themselves. Excelsior Beta Club will attend the National BETA Convention in Frisco, TX. later this month. Our students will compete in Academic and other categories. Excelsior School has been approved as a historical site by the Texas Historical Society. If anyone would like to make a donation for the historical marker they can bring it by or mail it to the school. The Timpson Elementary School Agents for Change organization is dedicated to making a positive impact on the school and community. Mrs. Tammy Sparks is the sponsor of this organization. When the students in Agents for Change found out their beloved sponsor was sick, they wanted to help her. Under the leadership of fifth grade teacher Ms. Stephanie Jamar, the group collected donations at the Timpson vs. Shelbyville game. People from both Timpson and Shelbyville donated over $600 that will go to Mrs. Sparks to help defray medical expenses. Agents for Change want to thank everyone who helped with this important cause and the entire TISD family wishes Mrs. Sparks a speedy recovery! 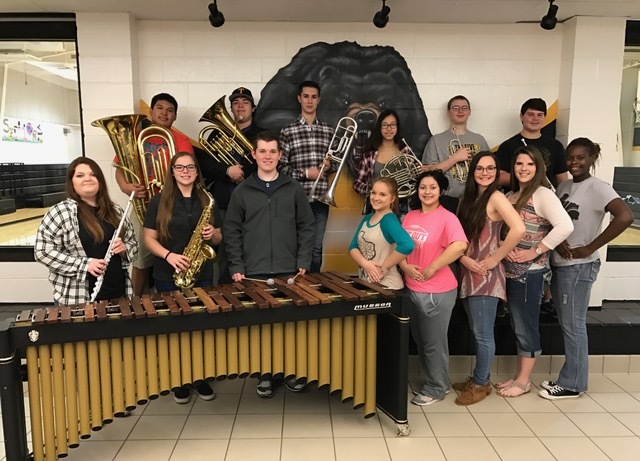 Timpson Band Students Earn 62 Medals at Solo and Ensemble - On February 3 and 4, members of the Timpson High School Band performed at the Region 21 Solo and Ensemble Contests in Nacogdoches and earned a total of 62 First Division medals. Along with the twirlers that earned medals in October, 14 students have now advanced to the Texas State Solo and Ensemble Contest held in n Pflugerville, TX on Memorial Day Weekend! Congratulations to these students for working very hard and for doing such an outstanding job representing Timpson ISD! 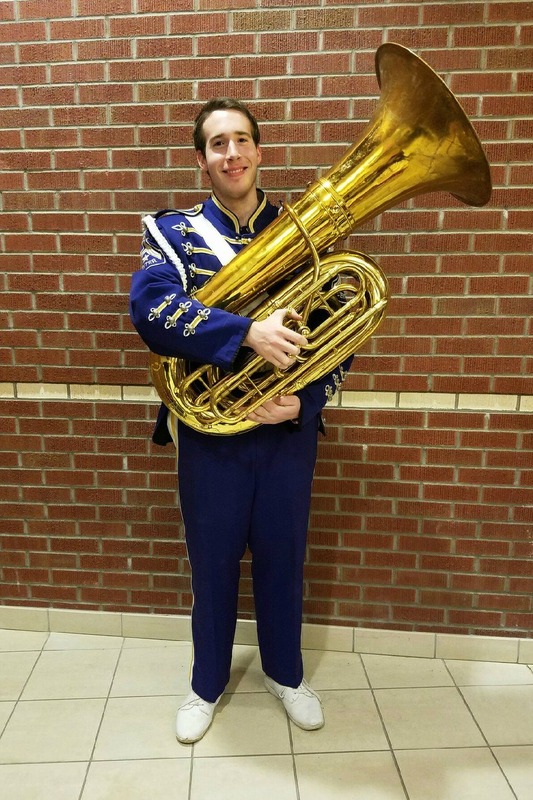 Timpson Band Students Advance to Texas State Solo and Ensemble Contest - Fourteen Timpson Band students have advanced to the Texas State Solo and Ensemble Contest which will be held in Pflugerville on Memorial Day weekend this coming May. To advance to the TSSEC, students must make a First Division rating on a class one solo while playing it from memory, make a First Division rating on a class one ensemble, or make a First Division rating on a twirling solo or ensemble. Pictured are the Timpson students that have qualified for this contest. (Back Row L-R) Brass sextet: Fabian Martinez, Marc Carroll, Devin Kimzey, Julieta De Leon, Dallas Dennis, and Bradley Young. Our soloists advancing to state are (Front Row L-R): Rebekah Parks, flute; Kendall Archer, alto saxophone; Connor Timmons, marimba and piano (he advanced to state with two memorized solos! ); Twirlers (L-R) are: Kayleigh Wolf- solo; Maria Palacios- solo and ensemble; Aislynn Kimzey- ensemble; Kristyn Rader-ensemble; Ja’Karia Deckard- ensemble. 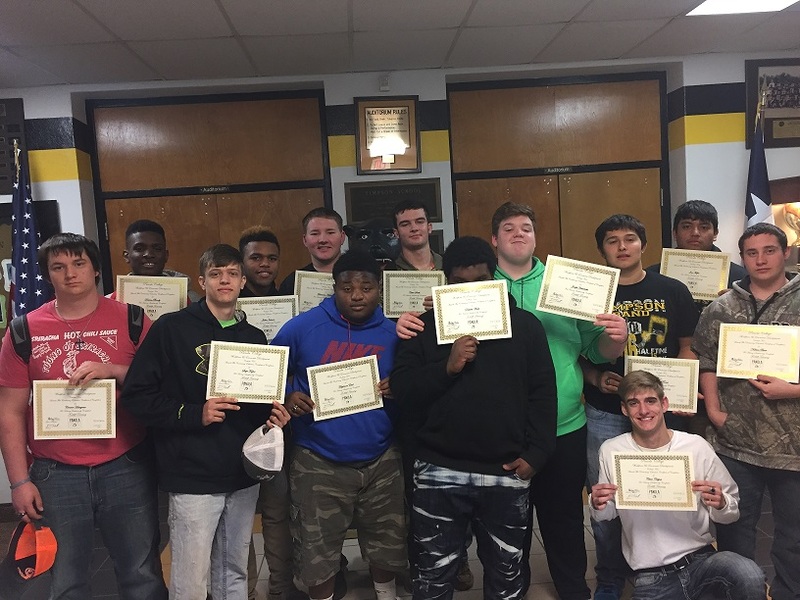 Congratulations to all of these students for your outstanding accomplishment! 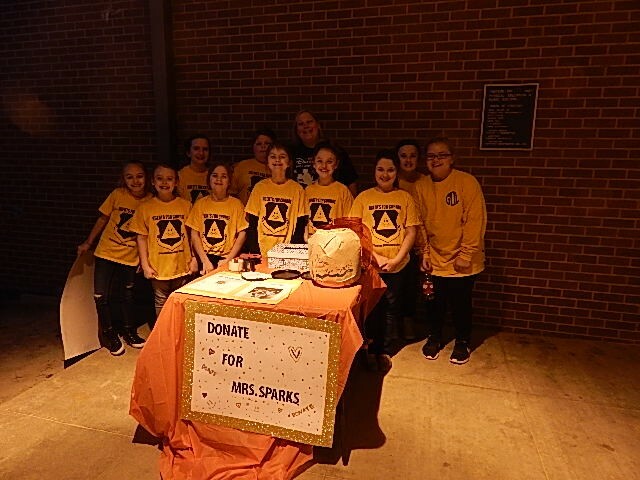 Agents for Change – The Timpson Elementary School Agents for Change organization is dedicated to making a positive impact on the school and community. Mrs. Tammy Sparks is the sponsor of this organization. When the students in Agents for Change found out their beloved sponsor was sick, they wanted to help her. Under the leadership of fifth grade teacher Ms. Stephanie Jamar, the group collected donations at the Timpson vs. Shelbyville game. People from both Timpson and Shelbyville donated over $600 that will go to Mrs. Sparks to help defray medical expenses. Agents for Change want to thank everyone who helped with this important cause and the entire TISD family wishes Mrs. Sparks a speedy recovery! TISD Board Member Spotlight – Dannie Hunt has served on the Timpson ISD Board of Trustees for 11 years. He is married to Maureen Hunt. They have one son, Joseph, who is a THS graduate and a grandson named Sawyer. Mr. Hunt is proud to serve on the board because he sees it as his way of serving children who are the future of our school, community and nation. He appreciates the dedication of our teachers, coaches and other staff members for their dedication and willingness to go the extra mile in meeting the needs of our young people. Mr. Hunt said the teachers and coaches he had in school were like parents to him. They met not only his academic needs but also instilled in him the importance of team work, a strong work ethic, good morals and the desire to succeed. Mr. Hunt is excited about the Collegiate Center because it gives students the opportunity to earn college credit or earn a vocational/technical license that will enhance their career opportunities after graduating from high school. He also appreciates the Timpson community for their willingness to pass the recent bond election that will provide even more opportunities for students to excel in academics and extra-curricular activities. He is very aware that because of the bond election property owners’ taxes increase so he pledges to do his part to ensure the money is wisely spent and the new buildings and improvements will benefit students and the Timpson community will be proud of their school facilities. Thank you Mr. Hunt for your desire to serve your community by serving students. We appreciate your hard work and dedication. 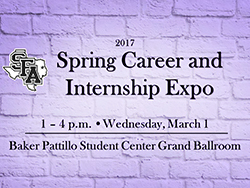 SFA’s Center for Career and Professional Development will host the 2017 Spring Career and Internship Expo from 1 to 4 p.m. Wednesday, March 1, in the Baker Pattillo Student Center Grand Ballroom. Faculty and staff members are encouraged to inform students about the event, especially those who may be looking to find a full-time or internship position. Click here for a list of participating employers. If a faculty member would like record of attendance for their students, a class roster or a sign-in sheet must be provided by the faculty member to the CCPD by Tuesday, Feb. 28. Students will need to bring their student ID for check-in, as well as copies of their résumé to distribute to employers. Professional dress is required. Résumé assistance and the center's free Career Closet are available to help students prepare for the event. Information about these resources may be found on the center's website. 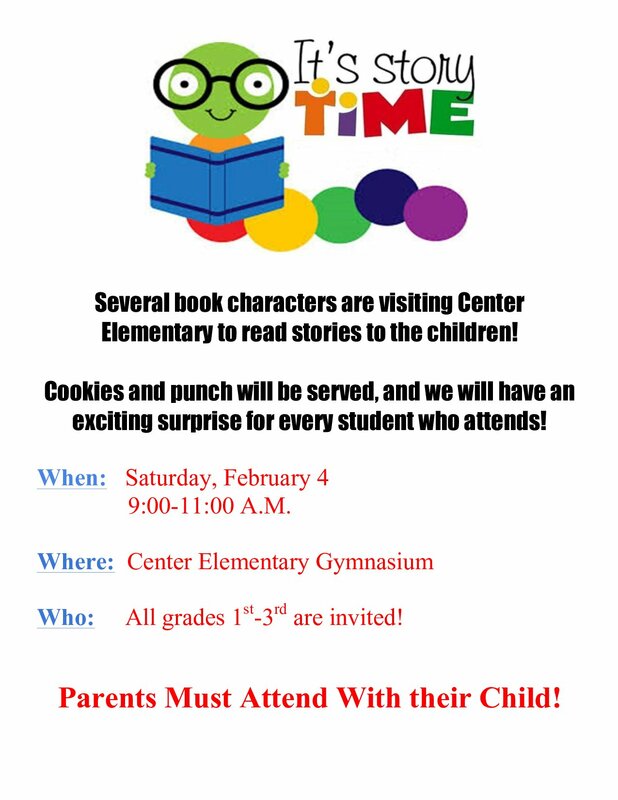 For more information, contact Brandi Derouen, assistant director of the CCPD, at (936) 468-3305 or derouenb@sfasu.edu. SFA’s Faculty Senate will host a faculty social from 4 to 7 p.m. tomorrow at Maklemore’s Ale House and Bistro. Faculty members are encouraged to attend in support of the university-wide goal of increasing campus connections. For more information, contact Dr. Le’Ann Solmonson, professor in SFA’s School of Human Services, at (936) 468-1065.
backboard donated to the school from Ace Ambulance Service. Mon. Feb. 6 – Middle School basketball vs. Mt. 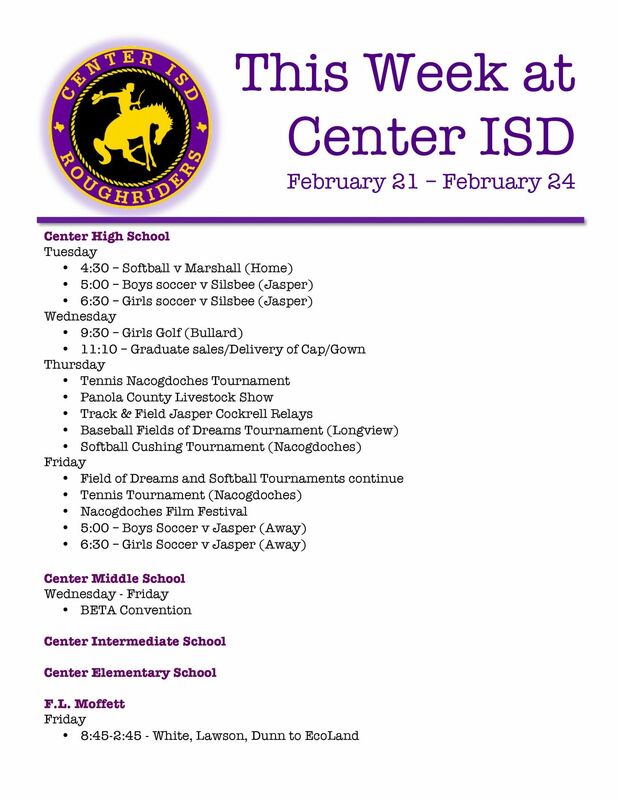 Enterprise – There @ 4:30 p.m.
------------------ Basketball vs. Joaquin – Home JVB/VG/VB @ 4:30 p.m.
----------------- Basketball vs. San Augustine – Home – Sr. Night JVB/VB @ 5:00 p.m.
PE Equipment Donated – Timpson ISD students have new physical education equipment to use in P.E. class thanks to Ms. Penny Ramsey. 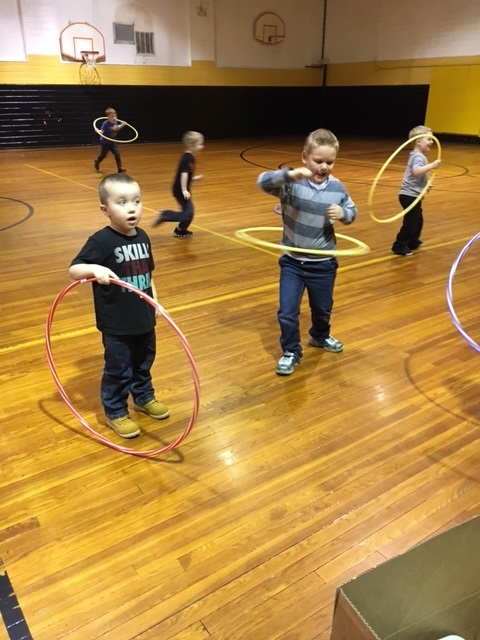 Five dozen hula hoops were purchased by generous people on the DonorsChoose website for Timpson Schools. 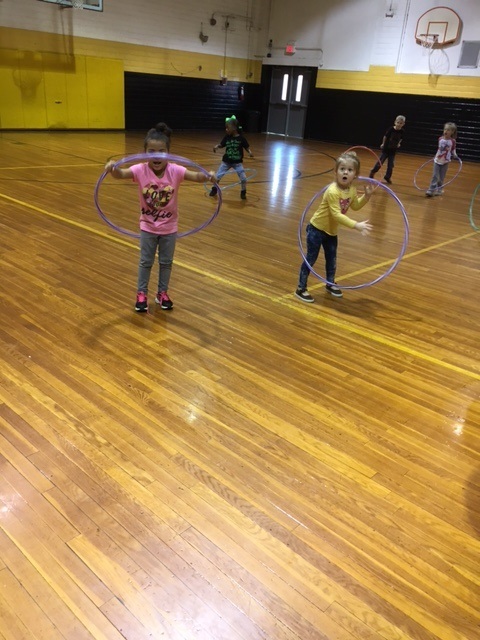 Along with the hula hoops, 30 basketballs and 20 volleyballs were also purchased and sent to the school. The total cost for the equipment was $703.00. Ms. Ramsey, who writes the application requests, says she appreciates all who donate to make these items accessible for our students to have. Ms. Ramsey we appreciate you for helping get this new equipment for our students. 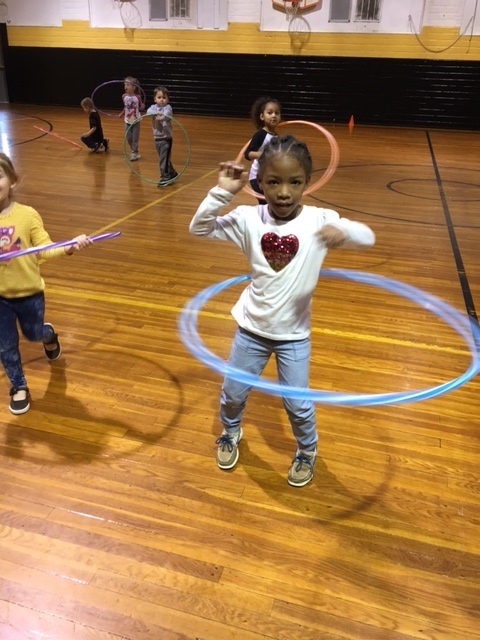 Attached are photos of Pre-K students who were the first to try out the new hula hoops. THS Band Booster Fundraiser - The THS Band Boosters are selling Crush Grams for Valentine's Day! 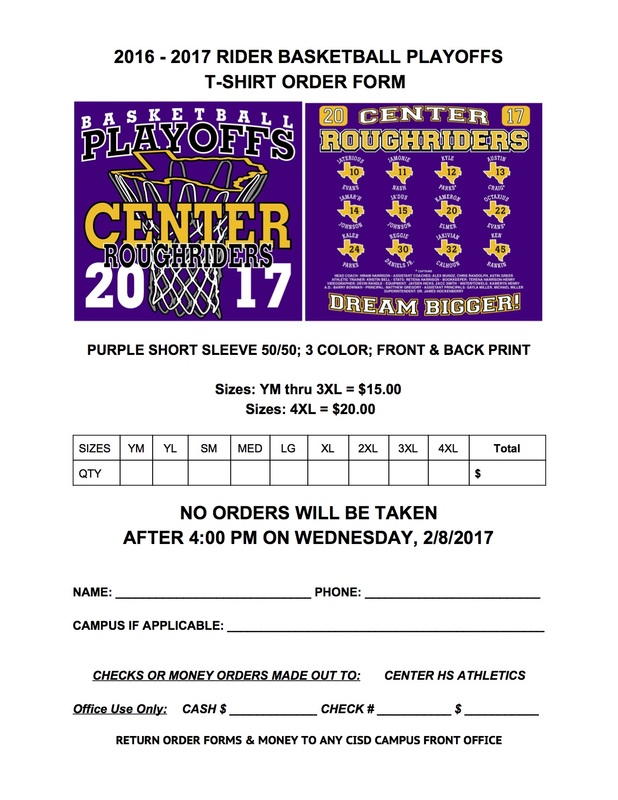 Please see attached order form for details!! TISD School Board Member Spotlight – Mrs. Joyce Wolfe has served on the Timpson ISD Board of Trustees for 12 years. She currently serves as the board secretary. Mrs. Wolfe is a 1975 graduate of Timpson High School. Mrs. Wolfe said she enjoys being on the board of trustees and thinks they work together effectively as a team who are focused on meeting the needs of the students and staff. She stressed the importance of supporting the teachers and ensuring they have the training, supplies and support they need to teach. She understands the positive impact teachers have on the education and lives of their students and truly appreciates all that Timpson ISD teachers do for their students. Mrs. Wolfe has an interest in all facets of the school system, including academics, extracurricular and school facilities. She is proud of the progress of the Collegiate Center that offers students the opportunity to earn a college 2 year associates degree and the opportunity for students to earn licenses and certifications in vocational/technical fields that will allow them to be job ready upon high school graduation. Mrs. Wolfe stresses the importance of keeping school facilities in good repair and is excited about the new opportunities students will have with the new buildings and improvements that will soon begin as a result of the passage of the bond election. Mrs. Wolfe shows her support for the school by serving on the board, attending athletic events, open houses, student banquets, graduations and other events. Mrs. Wolfe has a strong work ethic and is an outstanding example of being willing to work hard in order to achieve. Mrs. Wolfe’s service on the board and support of TISD is greatly appreciated. live feed you must like the Tenaha Independent School Facebook page. As he reads down the list of names, a huge feeling of disbelief hits him. pride began to flow through his body. state chair on February 8.
more, either by himself or with one of the directors. goal last year and he achieved it this year. I think his motivation was Mr.
will always be apart of his life. auditions held this year across the state at region and area levels. Stanford's first time to perform as a member of the ATSSB All-State Band. Saturday, February 11, 2017, in the Lila Cockrell Theatre of the Henry B.
Gonzales Convention Center in downtown San Antonio. find another level.” He added. 41-14 run. 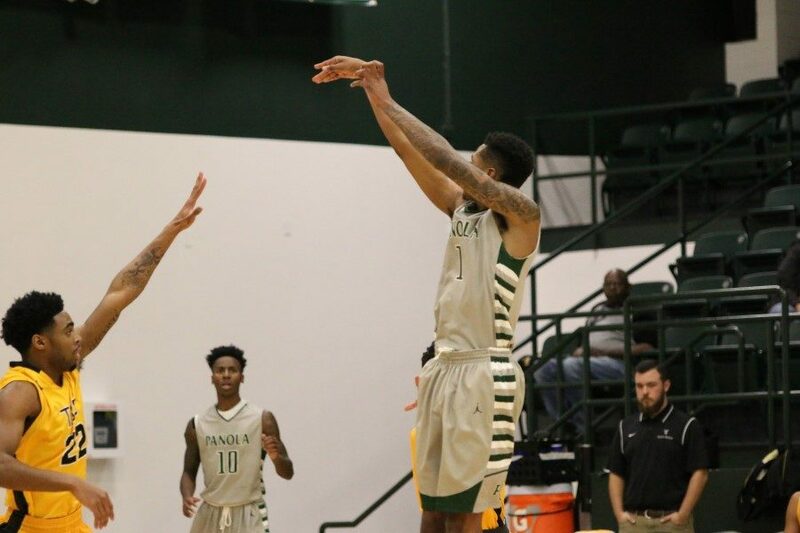 The monstrous output gave Panola their biggest lead of 71-44.
from the three point line.